Mai Pathani is a 50 year old housewife from the village of Nehal Chachar in Union Council (UC) Qadir Pur in Gotkhi, Sindh. Her husband is a barber named Khawand Buksh. The couple has four daughters and three sons together. Mai Pathani has kept two goats to contribute to the household income since her husband’s income alone is insufficient for the family of nine. Before the floods hit their village this year, Khawand Buksh provided hair cutting bservices to the village residents and in return each of his clients paid him with wheat grains after each harvest. Some of his clients in the village also offered Buksh’s family food supplies. However, this support was inconsistent. Despite living in poverty and on limited resources, Mai Pathani’s zest for life was alive. She celebrated Eid with her neighbors and relatives in the village with enthusiasm not knowing the day to follow would leave her house and her village under water. Mai Pathani and the rest of the villagers were completely unaware of the coming rains when all of a sudden heavy showers started pouring in and within minutes flood water had entered the village. The residents of Nehal Chachar were informed by authorities that the water level in their village would not rise and they could stay in the village without any worry. There had not been any major flooding in the area since 2010 so the villagers were quite confident about the safety of their village. However, on the night of 18th July, 2015, following Eid day, heavy showers of rain lasted the whole day with water overflowing from Indus River entering the village and submerging it completely. Mai Pathani’s family among many other villagers rushed to leave the flooded Nehal Chachar in the midst of the night. By this time the flood waters had risen up to five feet inside their homes. 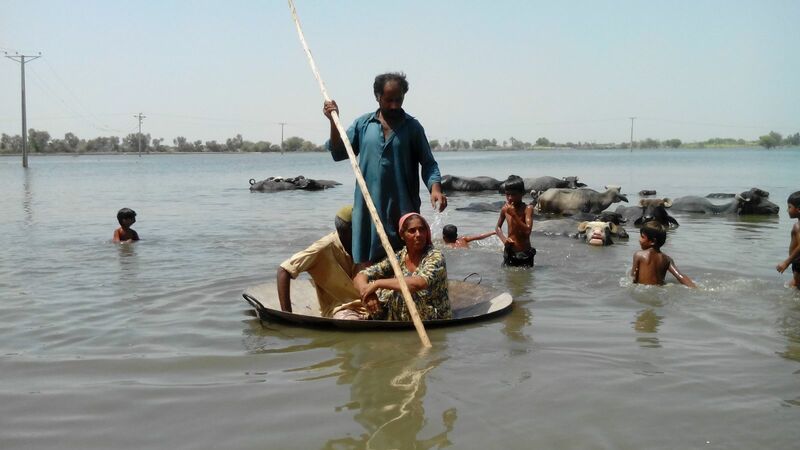 Khawand Buksh’s limited income did not allow him to afford renting a boat to carry his family members along with their household essentials out of their plummeting village to the emergency evacuation area at Qadir Pur Band. Inevitably, the family took the risk of sailing out of the village on a large sized frying pan despite the continuing heavy rains and strong winds. Buksh’s family had used the same transport method to float out of their village during the 2010 floods as well. It took them almost an hour to reach the Loop Bund via the frying pan. Watching an entire family floating in just a frying pan surrounded by nothing but water was quite terrifying for onlookers. However many could not see how Mai Pathani’s family was barely floating economically and socially as well. The family did not own any land or any sustainable assets to ensure their dietary sustenance. To add on, barbers and their families are often socially marginalized in communities in this area; the rigid class system denies such families an equal right to education and participation in social and political spheres. Mai Pathani’s house and their preserved stock of 480 kgs of wheat had been washed away by the floods. Agricultural and domestic assets of other villagers who often supported their family were also destroyed. Temporarily living at a shelter in Qadirpur Bund, Khawand Buksh sometimes travels to the nearby town to find some clients for his barber service. If fortunate to find clients, he earns PKR 50 a day. Earning this amount and sharing the meal bought by it with other affected families means that his own family hardly consumes a nutritional meal. The family is desperately struggling to make ends meet. Previously when the floods had not yet hit this peaceful village, Mai Pathani’s family at least took two meals in a day; both the meals consisted of either pulses or vegetables but were sufficient for their family. Since the advent of the floods however, the family’s meals reduced to one a day as pulses and vegetables were scarcely available. Being a woman and coming from a socially marginalized background, the floods and the ensuing displacement has exposed Mai Pathani to not just apparent risks as food insecurity but also to many protection issues. Being in a displaced setting, Mai Pathani and her two adolescent daughters have to wait the whole day to use the temporary constructed latrines. They have to wait till its dark and there are no men around the latrine area. Pathani and Buksh’s youngest son used to attend school but since the village was hit by the floods, his education has been put on hold too. As a responsible mother and a devoted wife, Mai Pathani’s hardship and sacrifices do not end here. She first feeds her seven children and her husband and eats only if there is any food left over after they have consumed their meal. Mai Pathani’s family was among the affected communities supported by Community World Service Asia’s Emergency Humanitarian assistance project for Floods Response in Gotkhi last month. She expressed that the food assistance by the organization has made a positive (suthu) impact on their lives. Before the emergency assistance was provided to them, the family only got to eat rice twice a week if lucky. Whereas since the support from Community World Service Asia, they are eating rice more often in a week. The quantity and quality of their daily meals has since then improved as well. Now they have more supply of pulses and wheat bread which makes up a more nutritional meal for the family. The Buksh family, more popularly known as “the floating family” now hope to return to their village and their home within the next two weeks. They are hoping the flood water levels will recede by then. The committed Mai Pathani plans to help her husband in reconstructing their house once they return to their village. They are optimistic that they will reconstruct the house after a month once the land is fully dry. Though, belonging to a socially marginalized family, Mai Pathani and her husband do not have very high hopes for a drastic change in their life after returning home. While other villagers will start sowing seeds in their crop fields, the floating family will wait for the harvest of the other farmers to share a small portion of their crop produce with them in return of Khawand Buksh’s barber services. Till then, Mai Pathani worries about the availability of sufficient food for her children. The worried mother envisages that if her children, including daughters, were equipped with some skills they would not have to depend entirely on the crop yields of others. Instead the family would earn and provide for themselves living in their own village.